Coach Steve Campbell’s Bears never trailed in the game, and it didn’t take long for them to take a lead as Tremon Smith intercepted Briscoe on the game’s opening drive and scored off a 42-yard return. But it was explosive plays in Central Arkansas’ passing game that fueled a 31-17 halftime advantage. 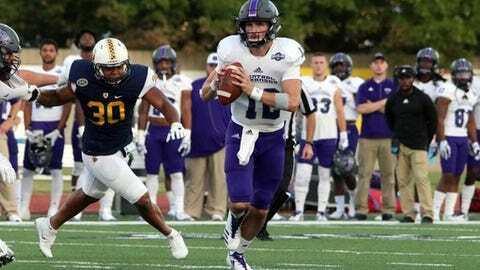 Hildebrand averaged 29 yards on his eight completions in the half, including 25 and 46-yard touchdown passes to Cedric Battle and a 74-yard score to Brandon Myers. The two teams combined for 29 penalties that accounted for 301 yards.